Σχεδιασμένο για ταξίδια τόσο επαγγελματικά όσο και διασκέδασης, το H Hotels - Metro North Uno είναι ιδανικά τοποθετημένο στη Κεζόν Σίτι, μια από τις διασημότερες περιοχές της πόλης. Από εδώ, οι επισκέπτες μπορούν να έχουν άμεση πρόσβαση σε όλα όσα η πόλη έχει να προσφέρει. Από τη βολική της τοποθεσία, η ιδιοκτησία προσφέρει εύκολη πρόσβαση σε κορυφαίους προορισμούς της πόλης. Όλα γίνονται με γνώμονα την άνεση των επισκεπτών. Για τον σκοπό αυτό, η ιδιοκτησία προσφέρει ό,τι καλύτερο όσον αφορά τις υπηρεσίες και τις παροχές της. Η ιδιοκτησία παρέχει δωρεάν WiFi σε όλα τα δωμάτια, 24ωρη φύλαξη, ημερήσιος καθαρισμός, 24ωρη ρεσεψιόν, ασύρματη σύνδεση Wi-Fi σε δημόσιους χώρους, φροντίζοντας για τη μέγιστη δυνατή άνεση των επισκεπτών. Το H Hotels - Metro North Uno διαθέτει 16 δωμάτια. Όλα τους είναι διακοσμημένα με γούστο και πολλά από αυτά παρέχουν ανέσεις όπως κρεμάστρα ρούχων, λευκά είδη, καθρέφτης, πετσέτες, σύνδεση internet (ασύρματη). Εξάλλου, το ξενοδοχείο διοργανώνει πολλά ψυχαγωγικά δρώμενα έτσι ώστε να έχετε πολλά πράγματα να κάνετε κατά τη διαμονή σας. Το H Hotels - Metro North Uno είναι μια έξυπνη επιλογή για τους ταξιδιώτες στη Μανίλα προσφέροντας κάθε φορά μια ήρεμη και ήσυχη διαμονή. 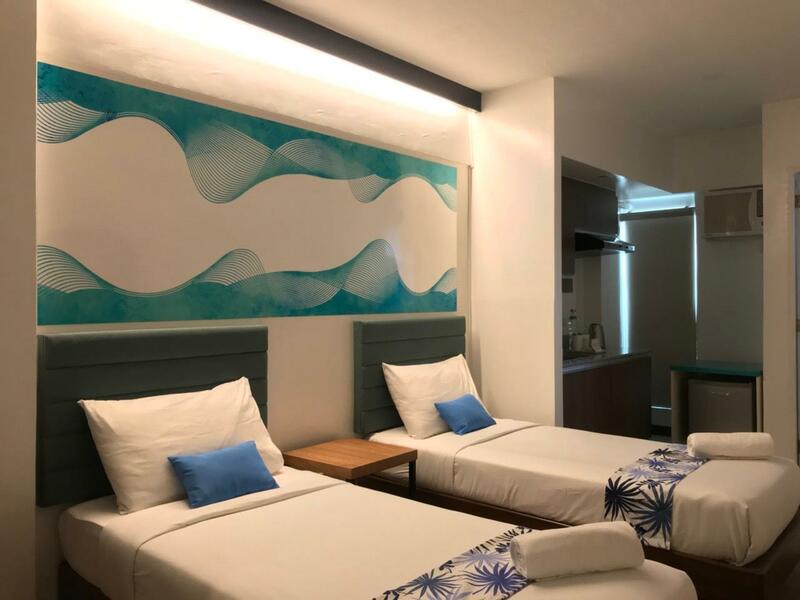 The property requires a security deposit of PHP 500 per room upon check-in for charges or damages during the stay and will be refunded upon departure. It would also be best if there will be variety of breakfast choices. In addition, a telephone should be also included in the room for the customers to order food from outside without going down the reception area. But all in all, my 2-day stay is amazing. Kudos to your staff. The "aura", the staff, and the amenities of the hotel, not to mention the internet were all very good! However, the location of the hotel is really a challenge. Taxis and tricycles had difficulty finding it. Grab would be the best option for a ride, but then it would be costly, especially if you are in budget. Dear Jennefer, Thank you for sharing your experience. We are glad to know that you enjoyed your stay at H Hotels. When going to H Hotels by taxi or tricycle, you may tell the driver to take you to One Nenita Place in Road 1. They will instantly know where to bring you. It was nice having you and we hope to welcome you again! For weeks, I have been seeking ways to combine a staycation that would afford me a way to "rechannel" my brains. I wanted a place that is quiet, comfortable, and easy on my budget. I discovered H Hotels by accident actually. 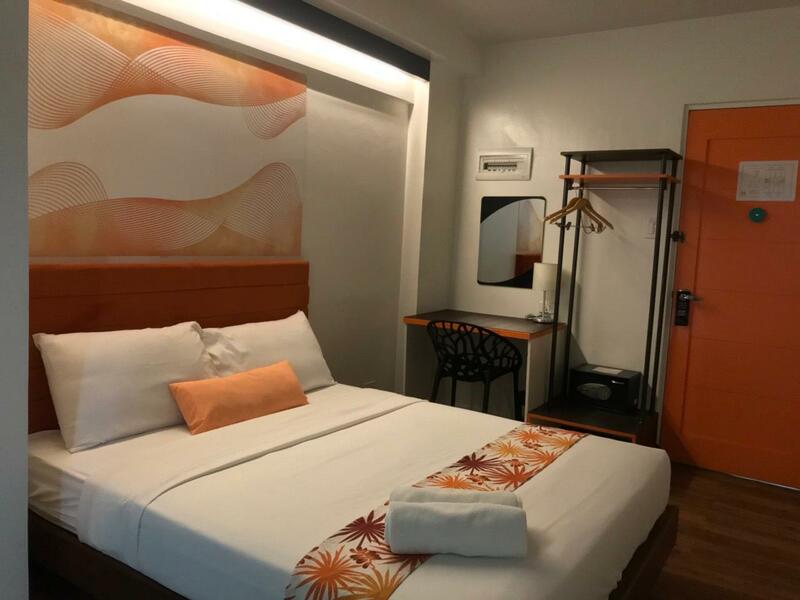 I was accompanying my niece back to Tandang Sora and needed a place to stay for the night so that I don't have to travel back to Alabang on a busy Friday night. When I saw H Hotels and read the reviews, I booked it instantly. From the moment I walked in to the moment I checked out, the staff were all very accommodating. The girl at the front desk already knew it was me long before I gave them my ID, and I thought that was really awesome. It was the most personalized experience i have ever had. They offered welcome drinks and was keenly surprised by their "magic" face towel. My breakfast was served to my room - another plus. The Internet was fast - another plus! So I finally got my wish to do a staycation and hibernation in one. Thanks H Hotel! I give you guys a 5 star for superb customer service, clean facilities and commendable amenities. You are so worth it! A great place to stay again and again! It has this small kitchen place with sink and small ref to store goodies! Bed are comfy and the comfort room are clean! I like their roof top to get some air but parking area underground is not good. It is to stiff and bringing big cars would hard for it to find it's place but you dont have a choice. I would love to go back as what matters most is the place for my body to rest quietly and cool! Were group of 3 people, we paid for the extra person but they dont offer extra beds. Then when we reach to our room we only have 2 pillows, then my friend requested for extra pillow and the reception inform him that is chargeable as well. The bedsheet it quite itchy also. one good thing in the hotel is there minimizing to the use plastic. Which is really good to save our earth. Dear Rachelle, Thank you for the feedback. Our rooms are made for for the comfort of 2 people. 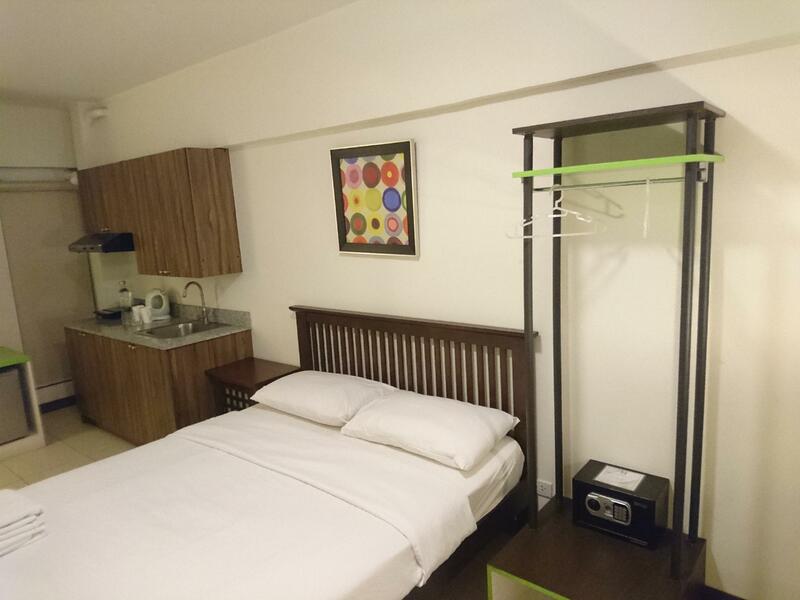 We can accommodate either an extra person, or an extra person with the extra bed setup. Our policies regarding extra charges are written on the registration form signed before checkin at the front desk. Make-up room is available upon request and is free of charge. Should you need assistance, feel free to approach our team during your stay. We are glad to know that you appreciate our sustainability program. Thank you for staying with us and we hope to see you again. The room is nice and clean! Love the design and with small kitchen area and ref. Roof is great for hangout! It was a great stay there. Tho things get complicated with parking(you muat be pro) and so traffic on rush hour. Just get waze whenever. Pros - One thing that's great is that they have kitchenette. You got plates, spoon and fork, glass and mugs. 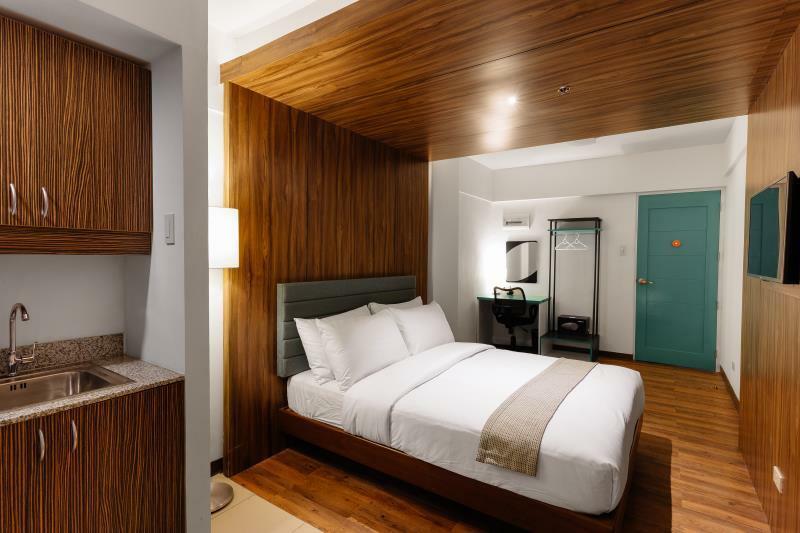 - It's got a cable TV, (by the way we booked premier queen, not sure in other rooms) - AC will definitely cool the room in no time (again it's a premier queen room) - You have a fridge, a microwave, kitchen cabinets and a exhaust. - You'll love the bed. (in a premier queen studio) - Roof deck cafeteria or whatever it is isn't that bad. it's a great place but not a great view. - wifi is good enough. not so fast but not slow. -no issue with their staff Cons - Front desk isn't spacious but that's sorta won't be an issue. - They have only one intercom on each floor so you have to go outside your room to make any requests. - I'm not sure about the complimentary water. it's not 'bottled' one from the grocery. - Room is spacious but you only got one desk. - We only stayed one night but the bathroom amenities won't seem to be enough (luckily we have our own) -They don't have toothpaste/toothbrush and slippers - place/hotel is quiet but. soundproofing is not so good. - it's a key. not a keycard. - strict 12nn checkout Overall. I would say it's a great stay for one night/day. I'd definitely recommend this one. Great stay for a cheap price. Wed surely consider booking here again. 3 nights I stayed in this hotel not even once they clean/tidied up my room, I even have to let them know that I need fresh towels. I dont know if its a hotel policy that you need to ask what you wanted done in your room but anyway my wasnt cleaned for 3 days. Dear Edgar, Thank you for your feedback. Make up room is available upon request. Guests are informed about this upon check in. We also have door hangers with "Make up room" and "Do not disturb" sign. Should you wish to have your room cleaned, just hang it outside your room and our team will attend to you right away. Thank you for staying with us and we hope to see you again. Me and my friends are always on a search on hotels that has good environment and a nice play to have a staycation. This place is one of the best (if not the best) I have stayed at! The rooms were clean and well maintained, the place is not so far from SM North and has a lot of restaurants around that we can eat in. Would definitely recommend. Since it's my first time here in the Philippines I have news about the hotels being dirty and being a person who travels a lot for his jobs I am quite picky in terms of where I stay at. This hotel easily gave me comfort and the nice staff was courteous enough to greet me every time I went down to roam around or to get some food. It's also a plus that it's only a few miles away from mall so that it has no hassle on where to get food or necessities. I came home finding a place to stay with my family since I work overseas and wanted to treat them in a staycation. Fortunately for me this hotel was nearby and although I quite doubt it since it's new we gave it a chance. Surprisingly, it exceeded our expectations. The room was spacious and is enough to fit all of us since we are 3 in the family. The front desk people were nice and approachable. Would definitely go back. Being in a vacation here in the Philippines, it is quite interesting exploring islands and beaches but when I got to the city I only stayed in this hotel and they were accomodating and proactive, I leave quite a mess when I am going out of my room and will always ask them to clean it out for me and eventually whenever I came down they will ask me if the room will need cleaning and it was a good thing because they were attentive. Will go back to this place for sure. definitely i will recommend to other people.. 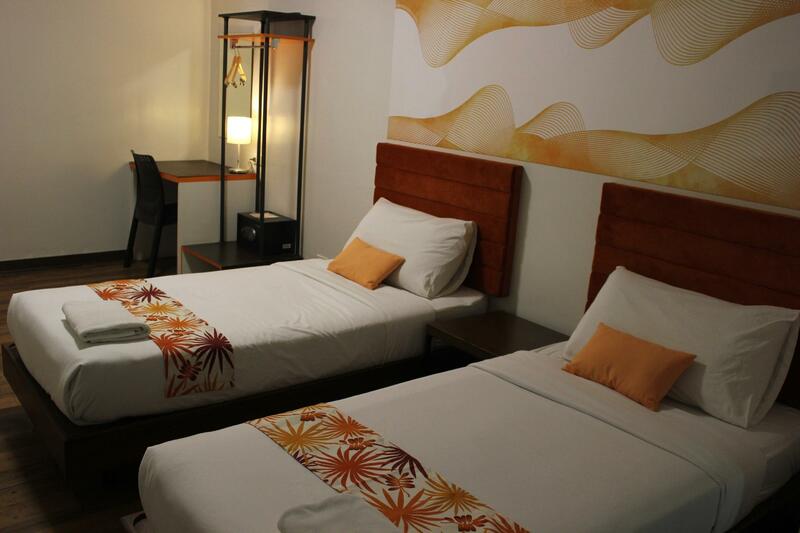 This ASEAN vacation, I needed a couple of hours to myself so I decided to book a cheap hotel. 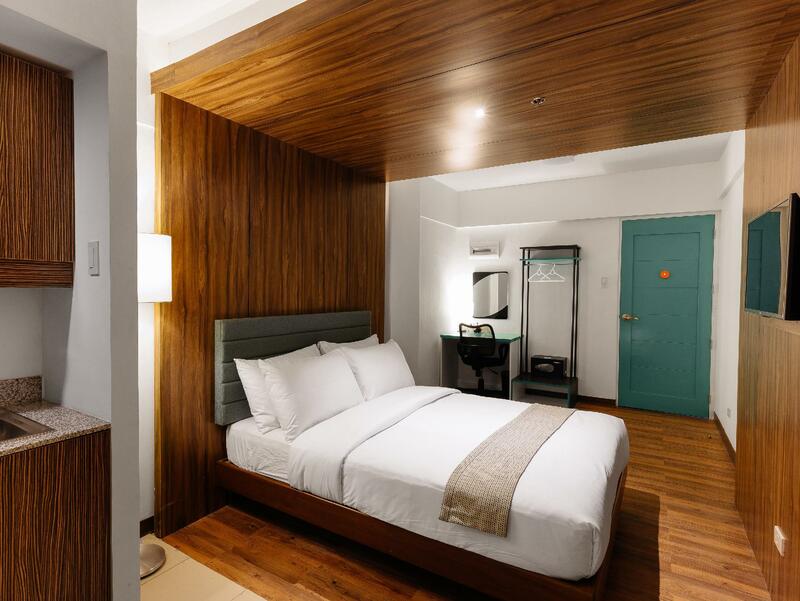 I want cozy bed sheets, aircon and TV, and I got all of them from H Hotels. I just don't think the location justifies the price as it's not in a prime spot. Yes, it's in QC but not walking distance to malls or convenience stores. Also, the work table in the room I was in has stains, the kind when you put a hot mug on wood - lots of it. The CR door also has stains, IDK what are them. I'm a bit OC so I'm really bothered. But anyway, the overall experience was fine. I got what I needed. The staff are nice (nice for my liking as I don't want people to talk to me nga.) Ahhh another thing, they don't provide slippers. :) PS. They have a really cute rooftop good for coffee or muni-muni. 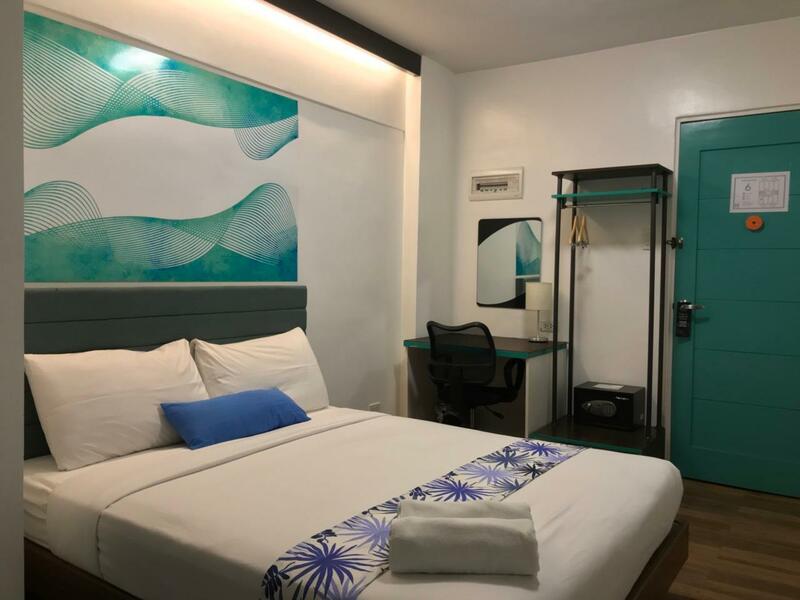 If you are looking for staycation, this might not be the best option unless you need to do some errands in SM North EDSA or Trinoma. The staff is accommodating and able to answer all our inquiries. Room extension for at least 30 minutes is not possible and need to pay extra P 200/hour. This is under their terms and conditions but hopefully they could have allowed us to stay a little longer. If you plan to stay, there is no common area conducive for working. You can use the roof deck but once it rains. You just need to sit on the floor or the stairs. No place for work. The view is not extravagant. So-so as it is in a residential area. My skin isn't sensitive but I got rashes after sleeping on their bed. :( My friend also had the same experience. I don't think it is a mosquito bite. It is definitely bed bugs. Please clean your room properly as we woke up with a dead cockroach on the floor on the way to the bathroom. Quite close to SM North Edsa (walking distance - a bit scary though to walk around the vicinity at night) and North Edsa MRT (tricycle then walk through Trinoma), which is good. Reception is not 24hrs, but staff is on call and lives nearby - so I didn't have to wait long. There is a security guard on duty 24/7 so you'd feel safe and wouldn't have anything to worry even if you check-in at around 10pm (reception closed at 8pm), which I did. I'd stay in that hotel again, if ever I have business in that area. Σταθμός MRT North Avenue 3 στα 0.92 χλμ.